A collection of insanely funny texts between parents and kids, When Parents Text is a surprisingly affecting window into the complicated time when parents aren't ready to let go, and kids aren't ready to be let go. The parents are well-meaning but hopeless, silly and a little corny, and befuddled by the technology. The kids are bewildered yet patient: the perfect straight man. And the authors, two recent college graduates, Lauren Kaelin and Sophia Fraioli, have an unerring editorial instinct to select the funniest, sweetest, quirkiest, most-telling exchanges. There's the revelatory: Mom: My fingers are saying words. This is amazing. The virtual scolding: Dad: I will deal with your sassy behavior when I get home. Meanwhile have some fiber. The manically inappropriate: Mom: Woo Hoo -- Ruth died, you know Uncle Lyman's wife, BUT I have your Braves tickets and check on the table!! And the downright inexplicable: Dad: You could poop your pants in the yankee candle store and no one would know. 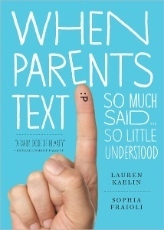 Launched as a website just last year, www.whenparentstext.com, is a phenomenon that has been featured in The Huffington Post, Entertainment Weekly, College Humor, and more. When Parents Text includes the best of texts from the website, plus more than 50 percent all-new material never before published. Includes an emoticon glossary and 16-page color insert of MMS texts -- multimedia messaging service, aka, bizarre photos from mom and dad. It's the perfect gift for every text-savvy kid to give to his or her parents.